Mildred (Millie) Barrett, 89, went home to her Lord and Savior on March 22, 2019. I can do all things through Christ who strengthens me. Phillipians 4:13 Her devotion to family and a Christian led life was her focus in everyday life. 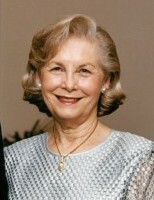 Mildred was born in Sheridan, Arkansas and moved to Texas as a young child. She was married to Billy Barrett in 1950 and started a long and treasured life as his companion and confidante, Wife and Mother, Grandmother, Great Grandmother and Friend to many. She was a graduate of Pleasant Grove High School and long time member of Pleasant Grove Christian Church and Park Cities Baptist Church. Survived by son Bradley Barrett and his wife Sandy; daughter Gena Bailey and her husband Ricky; Grandchildren Jennifer Panchalk, Nathan Barrett and his wife Jennifer; Julie Beichler and her husband Eric; Justin Bailey and his wife Adin; Chase Bailey and his wife Cassie; Great Grandchildren Bailey, Emily, Katie and Toby Panchalk, Davis, Adeline, and Emery Beichler; Barrett, Harlan, Kinsley Bailey, and Frankie Barrett. Those who have preceded her in death are her parents Herbert and Eltis Hale, her husband Billy Barrett, her brother Ray Hale. Special thanks for tireless and loving care by Carol, Jocelyn, Zee, Mamie, Ashley, Nicole and Lisa. Family visitation will be held at Laurel Oaks Funeral Home 12649 Lake June Road, Mesquite, Texas at 1:00 pm Tuesday, March 26 with Funeral Service following at 2 pm. Donations may be made to Thai Christian Foundation Dept. D8150, P. O. Box 650002 Dallas, TX 75265 or Pleasant Grove Christian Church 1324 Pleasant Drive Dallas,TX 75217 in her honor.